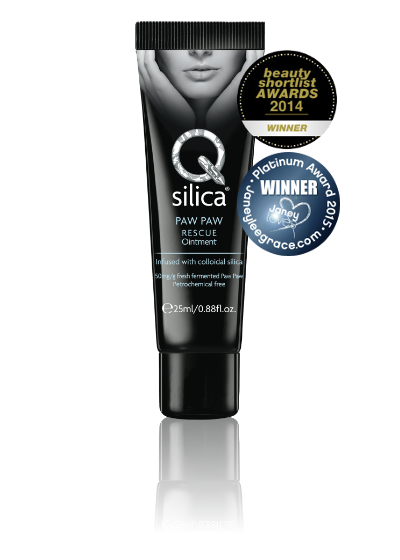 Qsilica RESCUE Paw Paw Ointment has won the Skin Saviour Award at the Janey Loves 2015 Platinum Awards. Janey Lee Grace's Platinum Awards 'celebrate everything natural'. So we are thrilled to have won our third Platinum Award in consecutive years, following wins for Qsilica REPLENISH in 2014 and Qsilica ONE-A-DAY in 2013. Qsilica RESCUE Paw Paw Ointment also won Best Lip Balm at the Beauty Shortlist 2014 Awards... and to win again with this coveted Skin Saviour Award, there's more proof that this Paw Paw Ointment is the right choice for everyone looking for the best and most natural skin balm in the world. In total, Qsilica has bagged SEVEN major awards since 2012!